Do you wish you had a place to enjoy great entertainment at home? A new home entertainment center could be just what you need to make the whole family happy with movies and video games at home, saving you money on expensive outings to the movie theater or arcade. Do you have a tradition of giving your family one big present each year for Christmas? Do something different than the ping pong table, pool table or outdoor basketball hoop from past years and make a new home entertainment center your big gift to the family this Christmas. It’s an upgrade you were planning on making anyway, but timing the purchase with Christmas and putting a big bow on top makes it extra special. Everyone in the whole family will enjoy the entertainment center for years to come. The versatile function of a home entertainment center means the kids can play video games in the afternoon, the whole family can enjoy a flick after dinner, and the parents can tune in to the nightly news once the kids are in bed. When your home features an entertainment area that everyone can enjoy, you’re more likely to spend evenings as a family instead of scattering to do your own activities. With a home entertainment center, you spend more time together without the high cost of going to see a movie or having some other outing. You end up not only improving family bonds, but saving money in the process. 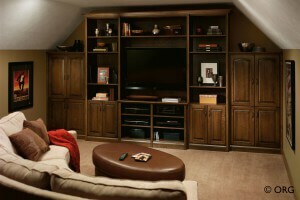 This means a home entertainment center is one of the best investments you can make! With the holidays coming up, there’s no better time to have a custom built-in entertainment center designed for your living room or media room. At SpaceMakers, we can design the perfect unit for your family based on the functionality and aesthetics you have in mind. Don’t settle for an ordinary home entertainment room when you can have the perfect center designed for you and your family! When you’re ready to move forward with your investment, please contact us for a free Atlanta home entertainment center quote.